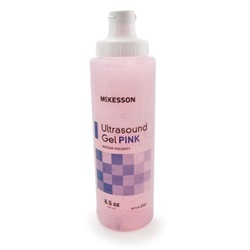 Pink ultrasound gel in 8.5 oz. (250ml) bottle. Gel is non-corrosive for extended instrument life as well as salt, alcohol, and fragrance free. Manufactured by McKesson. Comes as singles.